Today we have our first guest post by Daniel Frank from www.giveacar.co.uk. a company who recycle's scrap cars to raise funds for charity. The number of vehicles in use in the UK has been steadily rising for decades. But did you know that the average lifespan of a car is 13.5 years? Increasing safety standards and innovations have caused people to recognise deficits in their older cars, particularly when it comes to the safety of their children and updated NCAP safety ratings. Two million cars are taken off the road every year, but only 50% of them are processed through Authorised Treatment Facilities and given a Certificate of Destruction, despite European Directives on this very subject. The phantom cars are often stripped of parts and left to rot on the side of the road, leaching oil and brake fluid into the soil and damaging local ecosystems. 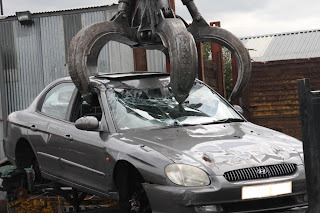 Sometimes, they are illegally put back into circulation by disreputable scrap yards when the cars are nowhere near roadworthy, causing a notable safety risk on the roads. Yet, if you’re a busy working parent, how can you find the time to organise the safe and ethical disposal of your car? 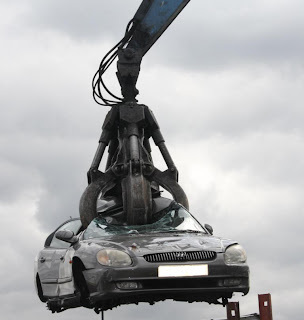 How are you to know that you’re getting the best value for your scrap metal? How do you know that the disposal facility you choose is reputable? GiveaCar has the answer. Recent graduate Tom Chance started the company in January 2010. It provides a free collection service for scrap cars, also recently extended to motorbikes. They organise the free collection of your car by a car salvage company. Then, they either send them for disposal, or, if it’s still roadworthy, send it for a salvage auction. Cars taken to an Authorised Treatment Facility and scrapped will have at least 85% of the weight recycled to comply with EU regulations. By 2015 this will rise to 95%. 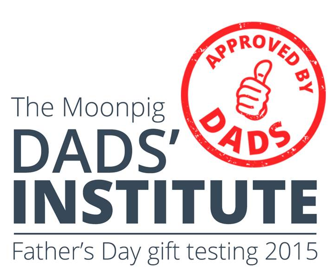 After taking a small administrative fee, they donate the proceeds from the disposal or auction to the charity of your choice. You will receive a notice of how much has been donated on your behalf approximately six weeks later. In the last year they have raised over £250,000 for various charities, including over £50,000 for Cancer Research UK. Many children’s charities have benefited from GiveaCar donations, including Unicef and The Children’s Trust as well as smaller, localised operations. For more information about GiveaCar or to enquire about the service in more detail.